Hi this is Devon and Sky reporting live from Toads Life! Today we got what we have wanted for about a month! We got toads! That's exiting. 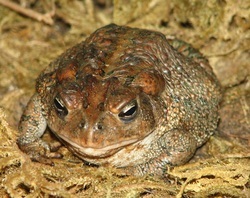 The Bufo Americanus have became just about toads. But, the African Clawed Frogs tadpoles didn't yet become frogs. It's so amazing that the Bufo Americanus can climb the rocks all by themselves! Again as I said they're just about turning into toads. They still have to grow more and shorten their tails. Since they're growing into toads, we had to lower the water level and add some rocks. But they really smell! Soon we will only need a plate of water in they're tank. They look exactly the same except one is larger than the other. They kind-of look like mini black frogs! (If you look closely). But they're so cute! They're having a mini rock climbing competition! One even jumped to another rock! We're going to need a bigger habitat soon! Sadly one of the toads drowned :( because since they are toads, now they no longer breathe water, so we had to take out all of the water. Sadly, once again we now only have one Bufo Americanus. Boy, is it sure hard to take care of those little critters! Since now they are toads they don't eat the food provided with the toad packet, they now eat tiny bugs (ants) that we collect from outside. Many people try to collect the ants but, some don't bother. That's it for this Toads Life! Today or frogs became air breathing. Sadly one of the frogs drown because it went off the rock and into the water. But the frog that is alive is doing very well. He seems to love the rocks. He always goes on the rocks and in to the shade. Eli and Vikram took out the water so he can be cozy anywhere in the cage. Now or frog will hopefully live. Hey 3-344 we have some more SAD-SAD-SAD news 2 tadpoles died. I took them both out of the the tank.We think they did not have air and land so now we have land for them so they hop out of the water whenever they like to.We noticed some little creatures in their tank. YAY!!!! One of our African Clawed Frogs just discovered the other side of the tank! 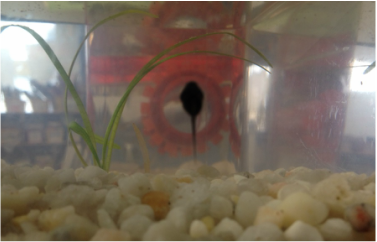 They might want their own rooms or maybe one of them is scared of the other side because it cant see the other tadpole? 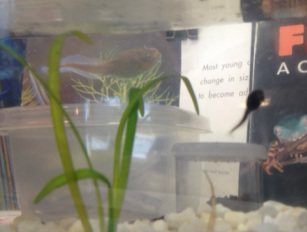 The tadpole that discovered the other side should be rewarded for using its smarts!! Hey 3-344 we have some sad news: 1 of our American Toads just died this weekend (May 3rd and 4th ). I never saw it when it was dead and I'm glad about that because if I saw it, I'd be like, "Nooooo!" But if our tadpoles were in the wild and one was weak and didn't eat enough food it would still die. So it wasn't our fault. So we had to change the water a little (like last time) just in case so the others don't get sick and die. But the good news is that the remaining 4 have grown bigger! You can even sort of see their legs forming now right behind their stomach. It's so small you can't even see it really. It's just like little bumps where the legs will be. So let's hope for good luck so the remaining four tadpoles don't die! Hey there, folks! This is Natalia reporting live from Mrs. Zimmerman's Third Grade classroom. Sadly, one of our dear Bufo Americanus passed away over the weekend. So, our brave volunteers (Gabi and I) bravely decided to take the dead one out of the tank and carefully dispose it. Also, we did a quick life test, to make sure all of the other tadpoles were alive. Then we changed their water and fed them. Back to you Gabi! Thanks again Natalia! 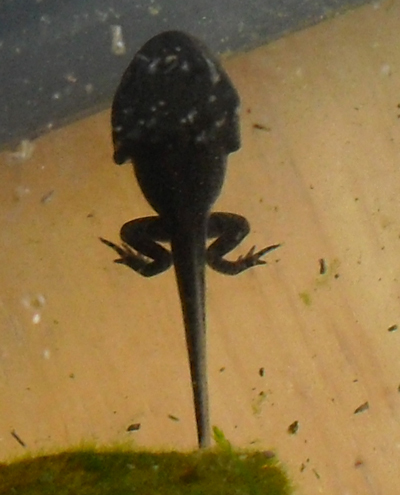 On the other hand, we have the African-Clawed Frog tadpoles. The intelligent one finally discovered the tube! All that extra money was finally not wasted! We also changed their water and fed them. 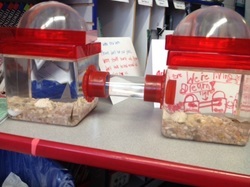 Over the past few days, we have noticed that they grown so much! Their tails have gotten so much longer and they are remarkably transparent while the Bufo Americanus are opaque. See you next time on channel 344, Frog Update.